Benchmark tester - You deal with a benchmark that was already developed for Faban or integrated with the Faban harness. You'll want to know how to submit runs, read the results and statistics collected throughout the run. fhb (Faban HTTP Bench) user - You do not have a predefined benchmark but want to create simple to moderately complex http tests. The fhb tool provides a simple command line interface to generate load and measure throughput and response times against arbitrary web sites. Moderately complex workloads can be defined in a workload configuration file and passed to fhb at invocation. Benchmark developer - You may have started as a fhb user and found that fhb can no longer satisfy your needs. You need to create your full blown workload to satisfy your requirements. The Faban driver framework allows you to do just that. In addition, the Faban harness allows you to customize the benchmarking process to handle tasks such as starting/restarting the server, data preparation, post-processing, etc. Benchmark integrator - You already have a benchmark, but the Faban harness adds a lot of value controlling the process of running the benchmark, collecting stats, as well as reporting and storing results. You want to provide your own hook to get this benchmark to run inside the Faban harness. 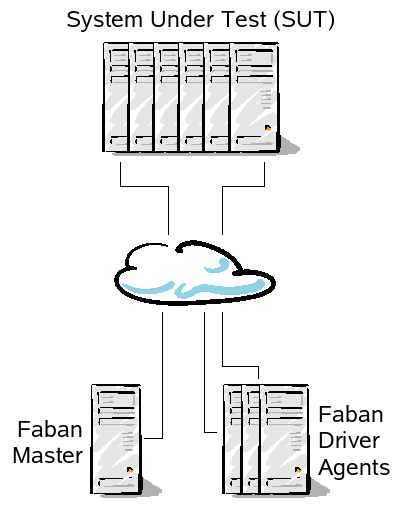 This picture illustrates a typical configuration of a Faban test environment. A Faban rig composes of one Faban master and optionally a number of agent systems that drives the load to the SUT. The Faban master typically runs a web server listening to port 9980 and provides the user interface for Faban. It also controls the process of the benchmark runs. The driver agent systems drive the load. The master may or may not act as an load driving agent by itself, dependent on the configuration. The system under test - or SUT - runs the server software that is being tested. The system under test may also run a Faban command agent which is a small, quiet process acting as a proxy for starting/stopping server processes as well as collecting relevant statistics on these server systems. As a special case, fhb (Faban HTTP Bench) does not support multiple driver agents. It also does not make use of the Faban master process for the web user interface. In contrast, fhb drives the load from a sinigle system and uses the command line interface for invocation. It also cannot control server processes on the SUT or collect any statistics for that matter. Faban is constrained to only one system acting as both the master and the driver agent. As you now probably have a vague idea on how you want to use Faban and how a Faban rig looks like, lets dive straight into getting Faban installed. Either Unix® or Windows® operating system. Linux®, Oracle® Solaris, and Windows 2003 and later have been tested. For Windows, installation paths for both Faban and the JDK must not have spaces in the path. DO NOT install in C:\Program Files. Select the user for running Faban - It is recommended that the user running Faban be the same user name and user id on all compatible systems, where applicable (Unix and Windows are not user name or id compatible). JDK1.5 or later - The JDK should be installed on the same path on all systems. Download the Faban kit - you'll need the full faban-kit-<build>.tar.gz for the master. The rest of the systems, possibly including the SUT, may have either the faban kit or a minimal faban agent installed. Login using the selected user on all the systems. Choose one of the machines not part of the SUT to be the master. Note that the master may or may not actually drive the load. Untar faban-kit-<build>.tar.gz in the chosen directory on the master system. This will create a sub-directory named faban. We will refer to this directory as FABAN_HOME. For instance, if you choose to untar the tar file in /opt directory (assuming the user name is faban), then /opt/faban is going to be the FABAN_HOME. If you install Faban just to use fhb, you can go directly to the fhb resources listed in Next Steps. This will create a file called faban-agent.tar.gz in your system's tmp directory. You'll need to copy this faban-agent.tar.gz to all the systems and install it into the respective FABAN_HOME, i.e. possibly same FABAN_HOME for the whole rig. The -s option is used for specifying the use of scp and ssh instead of the equivalend rcp and rsh. If it is not possible to install Faban in the same path for all path-compatible systems, symbolic links for FABAN_HOME work on all systems but the master. Faban has two major ways to communicate with the agents: 1) By starting the agent daemons and 2) by having Faban start the agents using a remote shell facility such as rsh or ssh. Note that combinations between agent daemons and remote shells are allowed. However, we cannot mix between differen remote shell facilities. For example, mixing rsh and ssh in the same rig cannot be done. The first step for setting up the network is, of course, ensuring that you have physical network connection to all systems in the rig. The ping utility is a good tool to ensure such connectivity. Make sure you can ping all network interfaces you may want to use, from all systems using those interfaces in the rig. Starting the Agent as a daemon is very straightforward. You'll want to run FABAN/bin/agent by hand or from an auto-invocation mechanism such as init.d on Unix or autoexec on Windows. Note that the agent daemon is to be started for all the systems wishing to use this mode of communications except the master itself. DO NOT start the agent daemon on the master. Edit the .rhosts file of the selected user so that Faban can rsh to all the systems that are part of the setup without being prompted for a password. You just need to add '+' character in the /.rhosts file. Note that this step applies to all the systems but the master, including all systems in the SUT that will be managed by Faban. Check that the master and other clients can “rsh <hostname> ls” each other without being prompted usually saves some time. This command will ensure that the harness can startup, shutdown, and reconfigure services on all systems. Setting up ssh is conceptually the same as setting up rsh. But due to the trust management of a secure shell, the process is actually much more complicated. First you will need to ensure that the systems can ssh to each others and run remote commands without requiring a password. This is system dependent and may be dependent on the ssh implementation. This is not discussed in this document. You may find Tim Cook's SSH Cheat Sheet blog entry a useful help for setting up ssh. After ssh is setup, the following process will test ssh and configure Faban to use ssh instead of rsh. Check that the master and other clients can “ssh <hostname> ls” each other without being prompted usually saves some time. This command will ensure that the harness can startup, shutdown, and reconfigure services on all systems. You may need to set the JAVA_HOME environment variable to a JDK1.5 installation. Bring up the Faban harness on the master driver machine. Access the harness interface from a browser window. Point your browser to http://<hostname>:9980/ or http://localhost:9980/ if you run the browser on your local host. Faban does not require any extra configuration. However, you may run into cases where you need certain administrative features such as security and auditing on a Faban master or special kinds of configurations allowing access to Faban through a Firewall. These many Faban features and a more detailed documentation on your Faban installation in general is provided in the Faban Harness Configuration Guide. If you cannot find the information you need or are trying to solve a specific problem that is not documented or not well documented, please post your questions on our mailing list at users@faban.sunsource.net. Good luck & have fun.